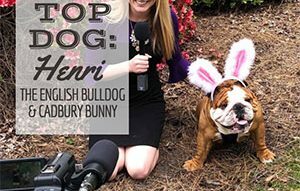 Benny Corgipants is this week’s Top Dog. 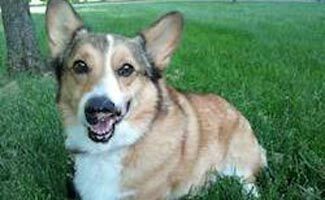 In November 2010, Benny was rescued from an awful puppy mill in northwest Kansas by the Corgi Connection of Kansas. During his time at the puppy mill, Benny was attacked and his injuries were left untreated, the missing pieces of his nose and lips left him disfigured, but not unhappy. Today he shares a loving forever home with his 11-year-old Corgi big brother, Biggie, a Cockatiel, and, “ugh” he says, “two cats.” He loves people (especially girls), rides in the car, long walks, and making new friends. You can join his 3,000+ Facebook fans and follow his adventures here. 1. What’s your favorite treat, Benny Corgipants? My favorite treat is bacon, but I do like the thrill of forbidden treats. You know, things picked up off the ground that humans think are disgusting. My favorite playmate is Herkie (Hercules) the Chihuahua. I like him best because he is smaller than me. I am kind of scared of larger dogs. I’m probably about 7 (I don’t know for sure). I would like to be Ernie the Corgi from Australia (aka Ernie Ozzy). Almost every day, he goes to a beautiful beach and he looks so happy, always smiling with his big, swishy tail. I don’t like ’em. They are stupid. And I really hate it when they want to rub up on me. Grrr. 6. We see you like to dress up: What’s your best favorite accessory? My favorite accessory is my Brave Coat. It’s a grey raincoat that keeps the rain off my back and it makes me feel handsome and brave. 7. Can we also follow your adventures on Instagram? Nope. Mama’s low tech, she hasn’t moved to Instagram yet. But Facebook, I am there. 8. How did you get your name? I was rescued by Corgi Connection of Kansas. Marte DeMars (Jeanette’s hubby) named me Benny C. after a childhood friend that he admired that had a facial deformity. My Mama named me Benny Corgipants when she started my Facebook page. My favorite celebrity dog is Harley. He’s a one-eyed Chihuahua that was rescued by National Mill Dog Rescue. That rescue organization and CCK are my heroes! 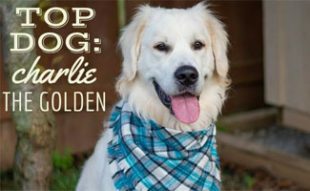 Harley has been through a lot, like me, and he works hard to help other dogs and speaks out against puppy mills. 10. What’s your advice for disabled dogs everywhere? Well, when I got to my forever home, I was scared of everything and worried that someone would hurt me again. 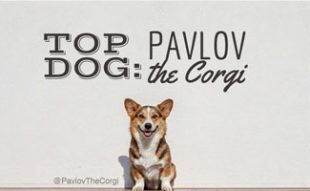 My Mama and Daddy try to treat me like a regular dog, but they also try very hard to be consistent and patient with me and give me time to learn to trust again. So my advice for other mistreated or disfigured dogs or people would be to put the past behind you and open up your heart again and love. People will love you for who you are on the inside, not what you look like on the outside. 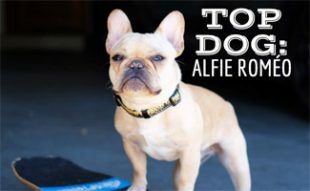 Have a Top Dog you think is worthy of being featured here? Post your nomination below and a brief description of why that special pup deserves some red carpet treatment, too. Just wanted to let you know that the famous Benny Corgipants has been diagnosed with cancer. All Corgi Nation is praying for him. Where it is located makes it inoperable. Would you please let your readers know so we can get everybody to pray real hard for this sweet boy? He started out in an awful place and has a wonderful home with his brother and cat with loving humans. Please follow up on him. Thank you so much. I am nominating Dora, a Borgi (Beagle/Corgi mix) owned by a friend of mine. In March of 2011, after an emergency splenectomy, Dora was diagnosed with hemangiosarcoma. The oncologist said that even with chemotherapy, Dora would likely only live six months, but her owner refused to give up. She started Dora on a low-dose chemo protocol in order to give her the best life possible for as long as possible. That was 30 months ago. And Dora is still her wonderful, hoarding, food-stealing, loving and adorable self. I am nominating my four-year-old Cavalier King Charles Spaniel, Georgia as Top Dog. Georgia has appeared on TMZ TV and won their national St. Paddy's Day photo contest. I am nominating her because she lives with syringomyelia, a neurological disorder affecting thousands of Cavaliers around the world. Featuring Georgia and how she manages her disease can hopefully help other owners of Cavaliers identify and treat this horrible disease. Georgia is a delight and is living well even though I was told her future was uncertain. I respectfully ask you to feature Georgia as Top Dog.